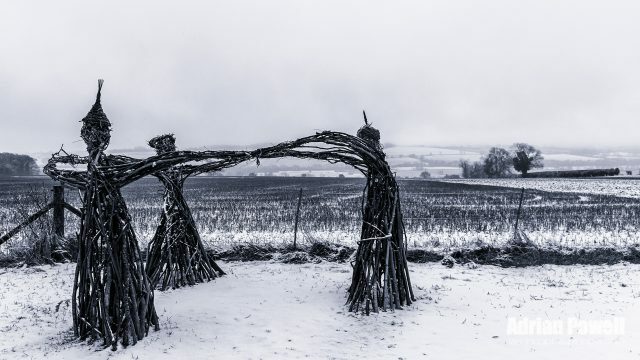 This is a temporary sculpture installation called ‘Three Dancing Fairies’, currently sited at the Rollright Standing Stones, Oxfordshire – previous photographs are Rollright Stones and Rollright Stones Revisited. The sculpture is sited near the stone circle (about 20m behind me when I made this photograph). This temporary sculpture by environmental sculptor David Gosling and his son, Adam, is inspired by William Blake’s painting of the fairies dancing for Oberon and Titania from A Midsummer Night’s Dream. Taken this morning during yet another snowy blast – it was more hail mixed with freezing rain falling by this time! And windy! I got quite wet walking Sparky here (though it didn’t really bother him, of course). If I took this again, I would make sure that the leftmost figure was in front of the fence post to hide it…but the driving hail/rain was making it difficult to keep the lens clear, so I didn’t notice this until I downloaded these shots into Lightroom – I might go back a try to clone that out in Lightroom later. ← Ducks all in a row?